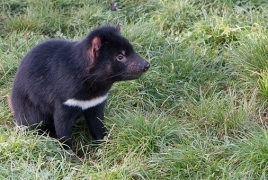 PanARMENIAN.Net - There's fresh hope for the survival of endangered Tasmanian devils after large numbers were killed off by facial tumours, the BBC reports. The world's largest carnivorous marsupials have been battling Devil Facial Tumour Disease (DFTD) for over 20 years. But researchers have found the animals' immune system to be modifying to combat the assault. "In the past, we were managing devil populations to avoid extinction. Now, we are progressively moving to an adaptive management strategy, enhancing those selective adaptations for the evolution of devil/DFTD coexistence," explains Dr Rodrigo Hamede, from the University of Tasmania. First discovered in north-eastern Tasmania in 1996, the disease has since spread across 95% of the species' range, with local population losses of over 90%. Dr Hamede's team has been collecting epidemiological evidence over the past 10 years. The group has plotted scenarios based on current infection rates in the wild, and in their forecast for the next 100 years, 57% of scenarios see DFTD fading out and 22% predict coexistence. The disease is transmitted when devils bite each other's faces during fights. "Our current hypothesis is that the biting doesn't only lead to the spread of tumours but it might be the starting point," explains Max Stammnitz, from the University of Cambridge, UK, who sequences tumour genomes. "If the scarring processes for the recurring wounds are interrupted by a mutation, this might become cancerous. It fails to heal and starts to grow out into an external tissue that may then become transmissible," Mr Stammnitz says.